CAMBRIDGE — It was the kind of autumn day that New Englanders cherish, the birch and maple starting to turn and a warm sun filtering through the leaves. Amid the joggers and dog-walkers circling Fresh Pond in shirtsleeves, Jessica Kensky and Patrick Downes seemed especially to bask in the moment, grinning as they walked side by side. When her black Lab splashed into a cove and chased sticks with slobbery gusto, Jess laughed so hard she doubled over. “I mean, how can you not be happy watching this?” she said, digging into her pocket for a treat. Being able to walk around the reservoir — the two of them up and about together, no crutches or wheelchairs — is no small thing now for a couple that once ran laps here with ease. Two-and-a-half years after the Boston Marathon bombings claimed their left legs and ravaged Jess’s right, they have begun to enjoy more moments like this that hint at their old life. Jess — who nine months ago chose to have her irreparably damaged, and excruciatingly painful, right leg amputated as well — no longer remembers what it feels like to step out of bed and put a foot on the floor. She misses both legs every day. But she is more than alive now; she is upright and mobile. A Boston Marathon survivor’s journey as she debates whether to live with pain or become a double-amputee. On Jan. 21, after the second amputation, she woke from surgery at Walter Reed National Military Medical Center — where the Pentagon granted her rare approval for a year of civilian treatment — feeling anguished. The sight of family ringing her hospital bed matched her old vision of what it would look like after childbirth, except she had lost part of herself instead. But she also felt relief, freed from the weight of the decision. And when she looked down at the smooth sheet below her knees, she felt unexpected satisfaction at being symmetrical again. With both legs bandaged — her surgeon had also cleaned out more shrapnel and shortened her left, for a better prosthetic fit — she understood it could be eight weeks before she could begin to evaluate whether she made the right choice. Patrick Downes and Jess Kensky took a break from their walk at Fresh Pond this month as she removed her left prosthetic leg to check for signs of bursitis. But when the incision from her amputation failed to close properly, Jess had to return to the operating room the next month. She worried that she would not be able to stand in time for Marathon Monday in April. 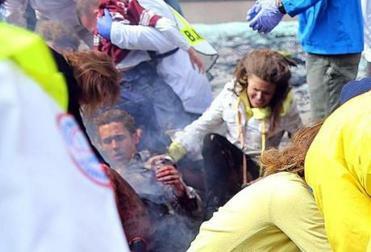 She came back from Walter Reed to Boston to testify in the trial of Dzhokhar Tsarnaev on March 9. Other survivors spoke of the triumph of walking past the bomber on prosthetics. Jess, a week after turning 34, got wheeled to the stand by a court officer, feeling vulnerable and exposed. A week later Jess and Patrick were in the basement garage of their Cambridge condo, about to drive to counseling, when Patrick ran upstairs to retrieve something. Depleted, frustrated at being dependent on others, Jess — wearing a prosthetic now on her left, but with her right leg still healing — tried to load her wheelchair into the trunk by herself. She lost her balance, slamming down on the bridge of fused bone and wire that locked her shortened tibia and fibula in place. On her back, she clutched her leg and tried to scream, but she could only gasp. In tears, she was sure she had shattered something, certain she had ruined her chance of standing again for the Marathon. She lay on the cold concrete, a former cancer nurse and marathon runner, and doubted she would ever again be independent. But her luck swung back; she healed rapidly from emergency surgery. Just a week later, she donned two prosthetics and pushed herself up between parallel bars, smiling as she tried to get Rescue, her service dog, to pose between her knees. The very next day they boarded a flight for Florida, where the Red Sox had invited Jess to throw out a spring-training first pitch. Many of the amputees in their “Boylston Street family” would be coming, to take their minds off the trial. Jess pictured herself keeling over at the mound before a horrified crowd, but she was determined to go ahead with it. So she took the infield with Patrick spotting her, set her Red Sox crutches down on the emerald grass, and heaved a strike to Shane Victorino. By mid-summer, she had stood and cheered at the Boston Marathon as Patrick hand-cycled with a team of wounded veterans; thrown him a birthday barbecue under the watchful eye of her occupational therapist; addressed the graduating nursing class at Johns Hopkins, her alma mater; passed her driving test on prosthetics, even as normally placid Rescue threw up in the back; and joined Patrick for a 5-mile race in New York — she walked and he ran, before circling back to join Jess and finish again beside her. On April 15, 2013, Downes and Kensky were on the sidewalk on Boylston Street after the first explosion. But humidity still caused flare-ups of phantom pain so bad she felt “haunted” by the very leg she removed. And when she tried to run on blades herself in August, she developed a case of bursitis so painful she needed a wheelchair for a week. She still can not walk as far or stand as long as she could in June. Then there are the news headlines: attacks in Chattanooga, Tenn., and Charleston, S.C., Bangkok and Ankara, Turkey. They used to hear about such tragedies and say “how awful,” and continue making dinner. Now they carry the weight of each one, picturing the victims, survivors, and relatives, knowing the years of pain and struggle to follow. And Patrick, whose physical rehabilitation has been more straightforward, was so focused on Jess’s recovery that only this summer did his emotions catch up. Normally quick to laugh, uncommonly kind (“What Would Patrick Do?” was a staff mantra when he worked with children at the therapeutic Gifford School in his 20s), he has struggled to leave the house, despairing over the evil in the world. At the same time, they face a transition back to working life, perhaps as soon as this winter. Jess has received an extension at Walter Reed through next summer, though they may move home sooner, while returning to Maryland for check-ups and prosthetic adjustments. They are eager to be defined again by something besides their injuries, but what comes next is hazy and daunting. Patrick, who was on the cusp of finishing a psychology doctorate, cannot see resuming a career of one-on-one counseling, at least not yet. And Jess no longer meets the physical requirements of the job she loved, logging 12-hour shifts on her feet while caring for and lifting chemo and bone-marrow transplant patients at MGH. And they are savoring their first long walks together in years. Rescue sniffed his way to another black Lab — older, bigger, part-Great Dane — whose owner looked up without betraying any notice of Jess and Patrick’s artificial legs. “Is this a puppy?” the woman asked. The woman said her own dog, still going strong, was 13. The woman smiled. “Coming here every day helps,” she said, and Jess smiled back, partway through a 2-mile walk, ready to envision that kind of life again. 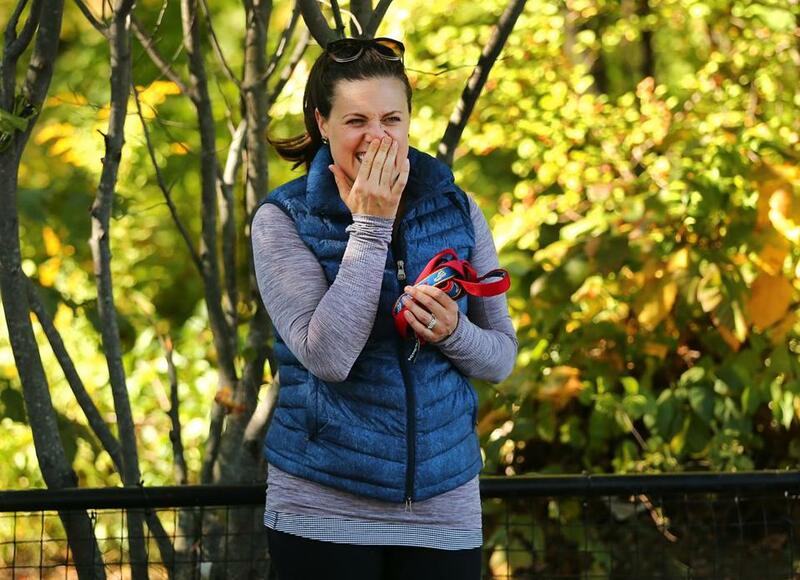 Jess Kensky laughed while on her 2-mile walk.